Crikey, I don’t recognise it so I don’t know what, in an ideal world, it should look like. Has it looked like it looks now for a long time or did it look like something recognisable a few days ago? Are those purply sticky bits the same thing? I’d dig it up and give it a jolly good shake to see what falls out. Then I’d get some fresh compost and have a rootle through the old stuff to see what’s lurking in there. Finally, I’d cut it down to a few inches tall, stick it in its new compost, water it well and tell it to buck up. Last year, I thought it was snails, so I've put Rose cuttings around it, as a deterent. That wouldn't work.I'm with pansy. Dig it out and plant it fresh if it was something you liked. 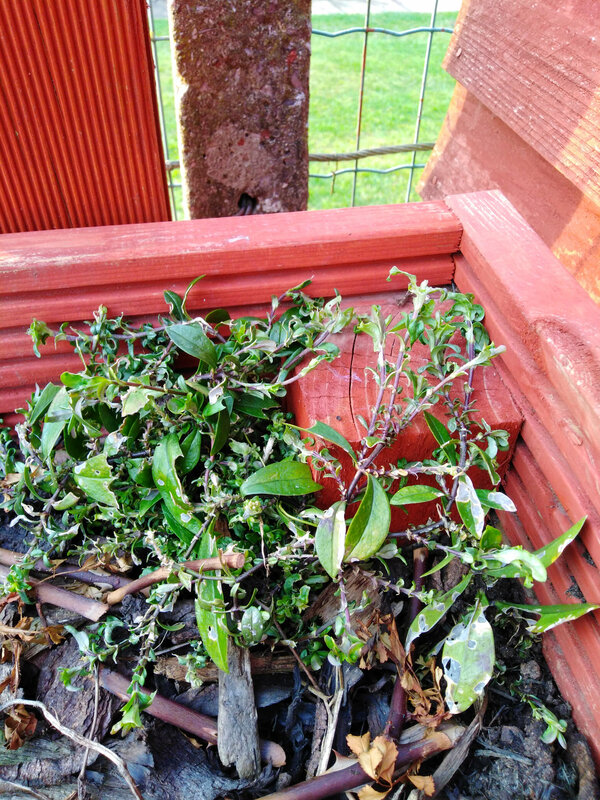 If you weren't to bothered about it, empty the whole thing out,add new compost and plant something else. You'll probably find snails lurking round the back of under the rim. Drop them on the ground and step on them.